. : Farm Forest Line - Wood growth and structure :. Wood is a complex, natural product. Between different tree species, its density, stability, durability, strength, burning properties, electrical resistance, reaction during drying, impact resistance, bending properties, acoustic properties, pulping qualities, workability and appearance varies markedly. Trees are classified into two groups: hardwoods and softwoods. This can be confusing because not all hardwoods are hard and not all softwoods are soft. Balsa wood, for example, is a hardwood, while some of Australia's hardest timbersfor example, Callitris pine, are softwoods. The difference is in the cellular structure of the wood. Hardwood timbers are made up of four cell types. Small wood fibres make up the bulk of the wood. Large cells, called vessels, function as pipes that move sap up the tree through the mass of fibres. Other cells are largely used to store food. With some experience it is possible to distinguish different hardwood timbers based on the number, size and location of the vessels. Softwoods do not have vessels. Softwoods have a simpler fibrous structure based on only two cell types. The easiest way to distinguish between the two tree groups is to remember that flowering trees are all hardwoods while cone-bearing trees are softwoods. Hardwoods include eucalypts, wattles and oaks while pines and cypresses are softwoods. As the tree trunk and branches thicken, a series of concentric layers of wood cells are laid down around a central core called the pith. These appear as growth rings. The pith is the remnant of the growing shoot that gives the tree its height. Because the pith has a cell structure different to the rest of the tree, it is often easily seen as a corky pipe in the logs centre. Growth rings often, but not always, represent annual growth. In temperate areas, tree growth during spring is represented by the presence of large cells with thin walls that appear lighter in colour. The darkness is due to the presence of smaller, thick-walled cells that are laid down towards the end of the growing season. In some hardwoods, the vessels form a ring in the early wood (ring-porous species) making the rings easier to see. The living trees stem is composed of different layers, illustrated in the cross-section diagram above. The cambium is a very thin layer of cells that divide to produce the bark cells (which protect the tree) and the wood cells. Sugars produced in the leaves travel down the inner bark, or phloem, feeding the cambium and, ultimately, the roots. Only a very small proportion of the wood cells produced by the cambium are actually alive. 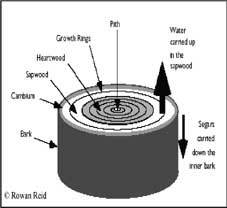 Most of the newly formed wood cells hollow out to form the sapwood through which water and dissolved minerals travel from the roots to the leaves. Other cells are used to store food provided by photosynthesis, including starch. The sapwood is almost always creamy white or yellow in colour and is usually two to five centimetres thick. In most tree species the sapwood band can be easily distinguished from the inner heartwood. The heartwood supports the trees stem but doesn't otherwise contribute to its growth. Heartwoods colour comes from resins, minerals and other compounds being deposited in the cells as they are decommissioned from their role as sapwood. These deposits, and the lack of food, add durability, colour and strength to the timber.